要旨 Seismic imaging of subducted Farallon and Tethys lithosphere in the lower mantle has been taken as evidence for whole-mantle convection, and efficient mantle mixing. 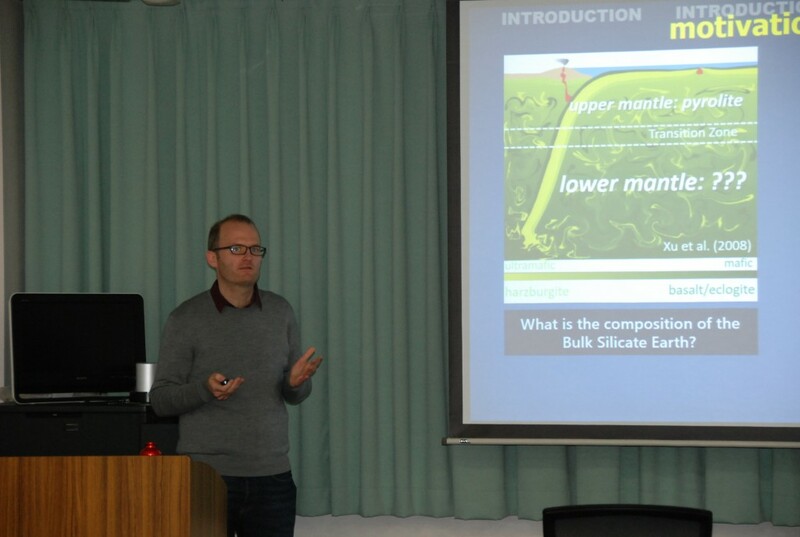 However, chondritic bulk Earth compositions are better explained by significant silica enrichment in the lower mantle relative to upper-mantle pyrolite. Moreover, geochemical signatures of Phanerozoic magmatic rocks provide evidence for the long-term persistence of primordial reservoirs somewhere in the mantle. In this presentation, I present several geodynamic mechanisms for sustaining largescale (primordial) heterogeneity in the Earth’s mantle. Mantle flow is controlled by rock density and viscosity. Variations in intrinsic rock density, such as due to heterogeneity in basalt or iron content, can induce layering or partial layering in the mantle. Such layering can be sustained in the presence of persistent whole mantle convection due to active “unmixing” of small-scale heterogeneity in low-viscosity domains, e.g. in the transition zone or near the core-mantle boundary . Alternatively, a primordial Fe-enriched layer can avoid any significant mixing over billions of years due to a large intrinsic density anomaly, consistent with the seismic imaging of thermochemical piles in the deep mantle . On the other hand, lateral variations in intrinsic rock viscosity, such as due to heterogeneity in Mg/Si, strongly affect the mixing timescales of the mantle. In the extreme case, intrinsically strong rocks may remain unmixed through the age of the Earth, and persist as large-scale domains in the mid-mantle (or “bridgmanite-enriched ancient mantle structures”: BEAMS) due to focusing of deformation along weak conveyor belts . That large-scale lateral heterogeneity and/or layering can persist in the presence of wholemantle convection can explain the stagnation of some slabs, as well as the deflection of some plumes, in the mid-mantle. Moreover, the (co-)occurrence of primordial piles and BEAMS in the lower mantle is consistent with a recent study of seismic reflectors in the mid-mantle . Thus, several large-scale reservoirs for the long-term storage of enriched and/or depleted primordial heterogeneity may have survived despite long-term vigorous whole-mantle convection. Ballmer, Schmerr, Nakagawa, and Ritsema (2015), Science Advances, doi:10.1126/sciadv.1500815. Ballmer, Schumacher, Lekic, Thomas and Ito (2016), G-cubed, doi:10.1002/2016GC006005. Ballmer, Houser, Hernlund, Wentzcovitch, and Hirose (2017), Nature Geoscience, doi:10.1038/ngeo2898.